Tis the season for outdoor BBQs, backyard parties, and poolside get-togethers. While all these activities make summer into summertime, they all require ice cold cocktails to really get the party started. After all, what is a party without a beverage? However, making sure that your guests are properly hydrated can pose a problem. How do you make sure everyone has a mixed drink in their hand and that you get to enjoy the party yourself? You could hire a bartender. Too expensive. You could stand there and mix the drinks yourself. That option leaves you working all night with no time to enjoy the party. You could leave a bunch of mixers and liquors out. However, without supervision things will get spilled, liquor will flow a little too freely, and glasses may get broken. So that leaves one solution: whip up a big batch cocktail beforehand so a refreshing cocktail is available all day long. With no hassle and no mess, it is the ultimate solution for an easy, stress-free party beverage. Are you ready to get mixing? Here are 20 delicious big batch cocktail recipes to get you started, all with four steps or less! Not a big fan of sangria? Bored of traditional red wine sangria and want to give the classic drink a twist? Whatever your reason for changing it up, this version is guaranteed to pique everyone's pallet. To amp up the fizz, use a rosé sparkling wine or champagne as an addition. Get the full recipe here. Let's be honest, sometimes you want a wine punch instead of a liquor-based one. Wine punches are the best drink recipes for those long days in the sun where hours sipping on vodka is probably not the best idea. The splash of lemon juice in this recipe really pulls it together, and honestly a dash of simple syrup would be delightful, too. Get the full recipe here. In today's world, a margarita is no longer just lime juice and tequila. It is anything but. However, with all the flavor competition from blood oranges and wine cocktails, it is hard to find those hidden gems that make margaritas not weird, but wonderful. Thankfully, we've found this Watermelon Hibiscus Lime Margarita for you. Watermelon captures the flavors of summer, and hibiscus and lime make it tart and refreshing even on the hottest days. This pitcher recipe is an adaptation of a famous United Kingdom cocktail that combines Pimm's with fresh fruit that makes for a great snack while you're sipping away. When it comes to big-batch summer cocktails, you can't beat the popularity and delicious of the Pimm's Cup. It almost feels like one of the healthy recipes with all of the fruit! Find the recipe here. By the time summer actually rolls around, most of us are fantasizing about that season in which we can drink warm mugs of cider cozied up in our sweaters. That's right, fall. However, it's still summer, and it's still hot. 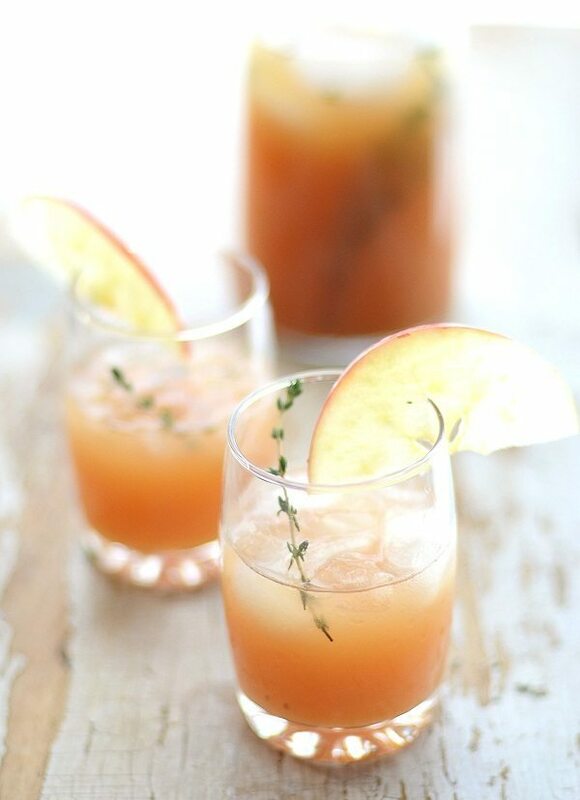 Therefore, give yourself a taste of autumn's crispness with a Cider Rum Punch. Rum punch is an easy pitcher cocktail to whip up and is one of the most popular big-batch drinks you can make. No one will be disappointed with this flavor profile. Get the recipe here. A little bit sweet, a little bit spicy, and a lot a bit on the edge. Just the way a summer romance should be. Stir it up and serve this cocktail at your next party and watch the sparks fly. A splash of club soda adds fizz to this otherwise non-carbonated drink. Get the recipe here. This cocktail has the simplicity of a backyard BBQ and the sophistication of a day at the races. So whatever you want to do, if you invite this cocktail and some friends along, it's sure to be a fun ride. If you aren't a big fan, consider substituting in blackberry or raspberry in its place. Get the blueberry-lavender simple syrup and cocktail recipe here. Limeade is a classic summer drink. Tart, tangy, and just the right amount of sweet, it provides relief even on sweltering days. Add a little vodka to the mix and you just might forget about the sunburn, too. If you want to get a little fancy, add some pomegranate juice for an even tangier option, Get the recipe here. Layered with as much color as a Negroni, this rum punch will have you ready to celebrate. Bursting with citrus and infused by strawberries, this cocktail will make your guests feel like they're sipping on a summertime sunset. Whether you're in Pennsylvania or Dallas or Baltimore or California, this recipe will make anyone smile. Get the recipe here. Ginger is a wonderful addition to any summer punch. It's strong, spicy flavor compliments the sweetness of cocktails to give the perfect balance of heat and sweet to keep you cool. Add some lime, basil, and strawberries and you have a perfectly balanced spritzer to get you through even the hottest days. A dash of St. Germain will liven the drink up just a bit. Get the recipe here. You read that right, this is a frosty, and it looks dang delicious. This isn't one of the pounder cocktail recipes you can gulp in one sitting without risking brain freezes. Instead, this thick margarita could be considered one of the dessert recipes of your barbecue because it is just that delicious. Find the recipe here. An old fashioned punch is reminiscent of trash can punch or Jungle Juice, but this particular champagne-based recipe adds a little class. FoodieCrush just takes the most beautiful pictures in all of food media, and with one look at this recipe, how can you resist it? Whether you're in Austin or Savannah or Manhattan or Chicago for the warm months, it doesn't feel any less hot. This sangria recipe pulls together the flavors of a piña colada without the hassle of prepping each cocktail one at a time. Everyone across the country will love this recipe, whether they're in the Bay Area or Houston. Find the recipe here. Ah, paloma. The sweeter older cousin of the margarita, the paloma features grapefruit juice for a tangy and sweet twist on a recipe developed deep in the heart of Texas. This recipe can substitute in grapefruit soda, but grapefruit juice is much easier to find in most grocery stores. Find the recipe here. A play on a Planter's Punch, this rum punch recipe will take you right into New Orleans for your first few sips and might have you seeing double afterwards if you don't take it easy. This recipe is a mix of fresh fruit juice and rum for the easiest recipe on this list. What's better than Sunday Funday? A Sunday Funday with a huge pitcher of Bloody Marys at the ready for all of your hungover attendees. Don't forget the delicious garnishes for this recipe, and maybe you might consider adding some mini sliders on toothpicks? So maybe you're not into the idea of wine or vodka, but a pitcher recipe sounds delicious. This Citrus Beer Sangria is for you. With only five ingredients you certainly have in right now, you can whip together a sangria recipe that is just like a shandy, but better. Do you love those Lime-A-Ritas that somehow always manage to give you a stomachache on a hot day? Fear not, for this recipe will be your new go-to. The four ingredients and two steps needed to make this pitcher recipe are both so simple, you'll wonder why you never thought of it before. Okay, so a moonshine recipe always requires a mixer on one end if you can't handle the high alcohol content. However, this Dreamsicle Moonshine is so creative, we can drink it straight. Whether we can see straight afterwards is debatable. Creating the orange simple syrup is the best part! Find the recipe here. Nothing is as fun as melting down Jolly Ranchers and these green apple candies deserve no better fate than this moonshine recipe. Simply simmer and transfer to mason jars. Pair with Mountain Dew, sparkling water, or Sprite for a real punch experience. Find the recipe here.